From the sidewalk, she and her family approach the place where a chestnut brown llama in a tiny top hat and a cream llama in a bow tie stand. The younger girls and woman who walk next to the girl are smiling. The girl in the wheelchair with the fuchsia t-shirt, short moppy brown hair and chin pressed to her chest is not. Her father comes from behind her chair and firmly, lovingly lifts her face. It looks like her chin may snap right back down. The brown llama approaches and sniffs the top of the girl’s head. Her eyes far away, she does not move. The white llama comes near and sniffs her palm, which her father has smoothed from clenched to flat. And it’s then that she smiles. Just briefly, corners of her mouth hint at joy. I learn that the therapy llamas are part of a wedding reception taking place at the restaurant next to the coffee shop where I sit. And though I have no idea why they’ve come for such an occasion, it’s clear they’ve come for the girl in fuchsia and for me, as I have a perfect view of them from this long wooden table where I watch it all like whimsical TV with muted sound. It is the perfect absurdity of a “Portlandia”-worthy moment with the groups of people pulling out their camera phones and women in short party dresses and high heels approaching exotic furry farm animals; even the lovely bride herself dressed in ivory vintage with large mammals that stand guard behind. The barista is smiling with wistful eyes and tells me it is her dream to raise alpacas (which are pretty close to llamas, she says) and so this distraction is her bliss. She proudly shows me the picture of her with the llamas, and we joke that with her black top and long black skirt, she looks like she’s attending a black tie event with two dashing escorts. “I definitely wore the right thing today,” she says still looking at the image where the white one looks nearly ready to kiss her cheek, and I imagine she will print this snapshot from her phone and frame it in gold. Sometimes beauty is unexpected like this. And it’s furry and long-necked, and it’s not what you thought you’d see when you arrived at work or what you’d write when you finally got the chance. When you run into the grandma you know from school on your way to that iced latte and tell her you are getting out and finding some time to write, and she asks what you write, and you surprise yourself by saying you write about finding the beauty in everyday moments, you have no idea it will be this one. You think it might be about the butterfly that danced along the sidewalk next to you, how beauty’s often right beside us. Or about the one-inch square of calm in the middle of chaos. Or about the light on the edges of dark. Or the look on her face as she approaches the horse for a birthday ride. You might have written about the lost diamond earring found in the same patch of grass searched for hours. The beauty that comes in the form of found treasure and a dad who will not give up. Yes, beauty is sometimes found after the search. Beauty is mystery, and though we craft and create it and so reveal the echoes of the original Beauty Maker, often it just happens, and it’s nothing to do with us, really. It’s there, and ours to behold. Or not. As I type, the woman next to me stands up next to the same window I stare through. She’s quiet for a long time. I wonder what she’s thinking about the scene. “So weird,” she finally says and sits back down. Last weekend, while in Central Oregon, my sister and I talked about our weddings (15 and nearly 11 years ago) as we looked out over a lake kissed by aspen and goose feathers — the glorious setting of many weddings. We talked about what we would do differently if our marriage ceremonies were to happen now, and I remarked that more than anything, I would allow myself the freedom to enjoy unplanned, free and imperfect moments. So caught up was I in making just so and meaningful and lovely that I forgot (or didn’t yet know) that so much falls unexpectedly among recesses of organza, tulips and tule. That much beauty happens right in the midst of things that don’t go as planned. Much life, I’m learning, is about finding the diamond among the blades, about opening eyes up enough to notice, really, for this life is hardly ever all one thing or another. Nearly every day there’s the hints of her smile and the joy of a papa holding up a chin, holding out a hand to make it happen. And there’s the barista’s far off dream and the llama fur and the glimmering wing. And the unplanned jig with your new husband as your poorly-tied train falls sloppily around you. When you let loose and let it fall, ah, there it is. I’ve been thinking lots of beauty thoughts these last weeks, though I haven’t had much time to write them. When June roses hit their prime here a few weeks ago, I handed over the iPhone and had my three girls snap shots of what they deemed beautiful, as I’ve done a few other times in “Through the eyes of my children.” I have been trying to get around to posting their views on lovely and will do that this week. And then last Friday, Lisa-Jo’s Five Minute Friday prompt was BEAUTIFUL. And then I stole away to write for a little while about beauty and then….llamas. Really, you do just never know. So happy to be back with you today. Linking this morning with The Extraordinary Ordinary and Just Write. Ashley. ..love this for so many reasons…and somehow I was greatly encouraged by your reminder that the beauty is there whether we see it or not…and I have a loved one there in Portland I pray would see the loving hands of his Father cup his chin and remind him how much he is loved and treasured and wha t a beautiful echo of the Beauty Maker he is himself. Thank you for this gift of hope. Dear Kelly, I am praying with you for this dear one in Portland and standing with you in that place of hope. May your loved one know of the Father’s perfect and most tender love…and may you, too, in a very real way today. I firmly believe when we learn how to walk in step with Jesus, not trying to get Him to match our strides, do we begin to see how the world around us is filled with bushes burning with His beautiful presence and fury lamas! Burning bushes and furry llamas, Mia! I love it. Yes, they are everywhere, aren’t they?! This is beautiful, and I so agree with you! There’s so much beauty when we take the time to notice. Yes, and far too often so difficult for us to really take the time or use the time to see. Thanks for your encouraging words, dear Luanne. So funny how beauty wears all kinds of skin.. or fur. And I love the way you SEE. And, thanks, friend for getting the-.” Anywhere but not right here” surrender I was writing about this week. Hmm… humbling to really record it in writing. But so encouraging to know I’m not alone in the wishing, the wondering, and the wrestling. Yes, Alicia. You are so NOT alone in that. Was just processing some of that this week…and continue to do so, navigating this life with its shifts and changes and oh-that’s-what-this-is-all-abouts. Your words helped me understand the process in myself. Thank you for that. I love how you wove all the beauty moments in and out of this post. A beautiful tapestry of lovely life moments. Thank you, Elizabeth. You are such a finder of life’s beauty. I notice that every time I come to your space. Ashley – I love this! I love this: “Beauty is mystery, and though we craft and create it and so reveal the echoes of the original Beauty Maker, often it just happens, and it’s nothing to do with us, really. It’s there, and ours to behold. Or not.” …and I love the line of how you say that ‘so much beauty happens right in the midst of things that don’t go as planned.’ This is Oh So True… and this is why I took my own FMF post on “Beautiful” last week and made a Link Up… so we can be hunting for it, searching for it… and surprised at where we find it! So glad you linked up today! I loved your encouragement to be a beauty hunter, Karrilee. Such a wonderful idea for a link-up. Thank you! My dear Ashley… My breath catches every time I read what you write. You have such a fluid grace with your words and the practically drip off the screen into my waiting eyes. It’s like you have lifted me out the dull and transported me to your place. Thank you for sharing this startling beauty with us!!! LOVE THIS! Wow, Tonya. Thank you for these words…so touched by them and you. i love how you have eyes for this kind of search, friend. and i especially loved this line: “this life is hardly ever all one thing or another.” deep and profound truth here, even if wrapped in the simple. thank you, Ashley. Thank you, dear Kelli. I love all the ways you search out grace and glory. You inspire me. I love imagining you in that beautiful and far less busy place, appreciating this random picture of urban life. I do love how God opens up beauty before us wherever we are. Hugs to you, too, Deb. This is beautiful, beautiful writing! LOVED IT! These eyes to see are much like yours, Mama. Thank you for helping me to appreciate beauty in all its forms, and thank you for your love and encouragement here, too, Mama, as always. Thank you, dear Kelly. Don’t you love those “letting it fall moments?” Harder to see them some days than others, but such joy when we are able to receive them with open hands and eyes. Hi Ashley! I know this probably sounds unbelievable, but this was my wedding reception you witnessed last July! I happened across your blog searching for other photos that people might have gotten of Rojo the llama and Napoleon the alpaca that day. 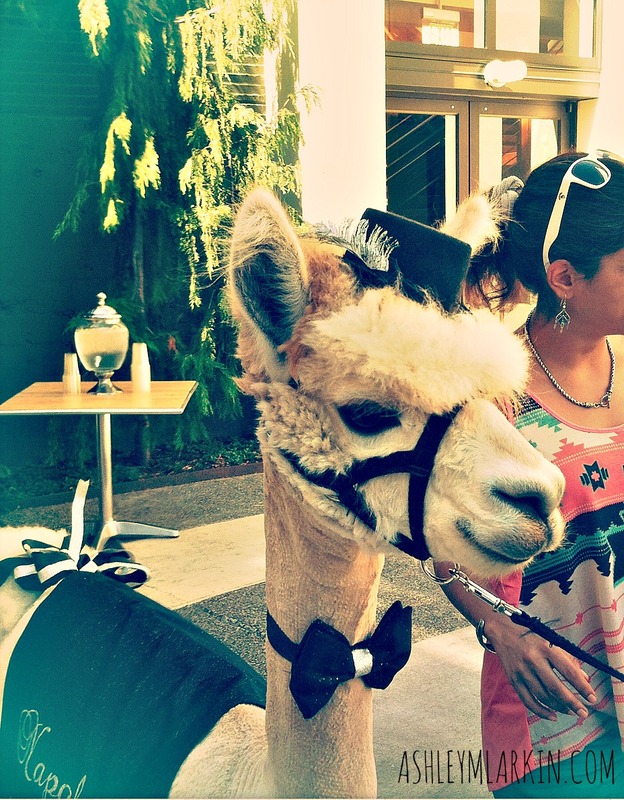 I realize how easy it is for most people to brush off a llama and alpaca at a wedding as just another Portland moment, and I’m so glad you chose to see the beauty and joy in it. That’s really why we had them at our reception – we wanted our reception to be joyful and fun for everyone and not just centered on my husband and me. I learned about the therapy llamas through a friend, and when I realized they were available for events, I hopped on it. We didn’t tell our guests about the furry greeters beforehand so it was a surprise to everyone, and everyone loved them. It makes me so happy that they brought joy to strangers and friends alike–I love that everyone else at the coffeeshop and on the street got to interact with them too! It was one of the many aspects of our wedding day that made it the best and most memorable day of my life thus far. Thanks for the insight and your lovely writing! Ingrid, I am amazed that you came across my little place here on the internet, and I am so happy to know that my telling of what I saw on your wedding day increased your joy! How lovely that you took the opportunity of “your day” to give a gift so unexpected and delightful to others. I will never forget that afternoon, honestly, so thank you! I’ve also recently heard from Lori, the owner of the therapy llamas and alpacas, and so the experience continues to bring joy to me. May the love and delight you experienced on your wedding day be a continual companion to you and your husband as you walk through life together.